Malware detection and prevention solutions are necessary in any organization. But, antivirus and even next-generation antivirus solutions can miss unknown threats, giving malicious software free reign to your systems and data. During this presentation, Nyotron’s Director of Product Marketing, Teresa Wingfield and Director, Solution Architects, Robert Zamani, will discuss why endpoint protection solutions relying on signatures, machine learning models and threat hunting can’t always cope with a never ending number of new attack methods and malware variants. While you won’t be able to stop all malware using endpoint security, you can stop the damage it intends to cause. Join us to learn how. As corporate data moves into cloud applications like Office 365, Box, and Salesforce, organizations are forced to rethink their security posture. Modern threats to cloud data range from unauthorized access to uncontrolled BYO devices. IT leaders need a forward-thinking approach to cloud security and must consider best practices when expanding the enterprise's cloud footprint, including proper identity management, comprehensive visibility, and zero-day control to name a few. Join cybersecurity experts Rich Campagna, Bitglass, Chief Marketing Officer and Salim Hafid, Bitglass, Product Marketing Manager for a deeper dive on these cloud security best practices. Multi-party permissioned blockchains present a set of new security challenges for dev ops and system and network administration. This webinar will cover why a lot of what we already know from securing N-tier architectures also applies to securing permissioned blockchains. It will also cover what is different and new and discuss strategies for the practical defense of these distributed systems. Will GDPR have the desired effect? Will it increase security, or see companies regularly hit with catastrophic fines for poor compliance. While some hackers crave the attention of a high profile attack or data breach, others prefer to work in shadows either trying to hide their tracks or are indifferent all together. Regardless, accurately understanding where an attack comes from is very helpful in defending against future attacks. More importantly, when companies and key organizations work together it is possible to tie together a multitude of individual footprints into a single, conclusive trail back to the originator. This session will focus on the importance of attribution and includes a case study of how a major cyber criminal was taken down, from the lowest foot soldier to the kingpin himself. 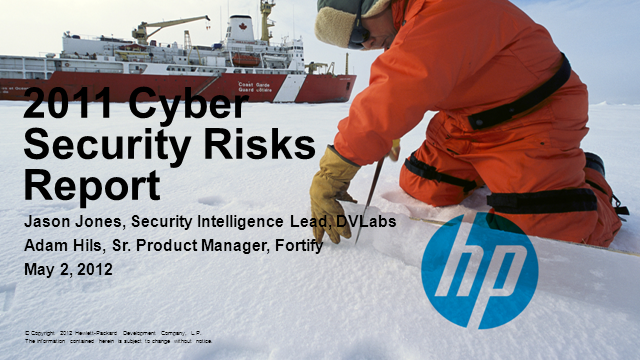 Cyber risk isn't new, but the stakes grow higher every day. An incident is no longer likely to be an isolated event, but a sustained and persistent campaign. There is no single solution that will offer protection from an attack, but a Cyber Resilience strategy can provide a multi-layered approach that encompasses people, processes and technology. Pete Wood will talk about eliminating the gap between IT and the business to present a united front against threats. This is a paradigm shift that uses security intelligence to guide decisions and support agility. Today's modern businesses gain competitive edge and remain innovative by using advanced analytics and machine learning. Utilising big data can build customer loyalty by improving personalised marketing campaigns; optimises fraud detection; and improves products and services by advanced testing. However, the data sets required for advanced analytics are often sensitive, containing personal customer information, and therefore come with an inherent set of privacy risks and concerns. - In what ways advanced analytics help businesses gain competitive edge? - What is defined as sensitive data? - Will GDPR affect the way you're allowed to use customer data? - What opportunities are there to utilise sensitive data? Unlocking the data’s true value is a challenge, but there are a range of tools and techniques that can help. This live discussion will focus on the data analytics landscape; compliance considerations and opportunities for improving data utility in 2018 and beyond. Discover the trends and opinions about insider threats that your peers have revealed in the recently published Cybersecurity Insiders report. Join Rob Marti, Director of Privileged Access Management at CA Technologies, as he guides you through the report and examines technologies and preventative measures. Selecting the right insider threat solution is a pivotal decision; make sure you know your options. Privva AutoAssess is an Artificial Intelligence solution to automate the process of responding to the security assessments you receive from your clients. AutoAssess learns from each and every assessment processed, so the Security Assessment responses generated are increasingly more accurate and consistent -- with fewer revisions required over time. Responding to security assessments can be a time consuming and sometimes frustrating process, due to complex variations of similar questions in multiple formats. Unfortunately, this process is only getting worse. As enterprises take a more proactive approach to data security, completing third-party vendor assessments has become a necessary cost of doing business. Privva can turn this time-consuming endeavor into an easy process, saving you hours per client and enabling you to focus on other critical areas of data protection. The Privva AutoAssess solution has reduced the time spent per client from 5 hours to under 30 minutes. Join Privva on December 11th to learn more about Privva AutoAssess. The new business reality of GDPR and how you use customer data is inexorably approaching, if you work in or are doing business with anyone in the EU you must deal with this regulation. With data protection, there are really only two options: protection of data through ever-more data centralization and security or turning the customer data paradigm on its head and decentralize the data. We have a new model: give your customers full control over their data, gain their trust, and lower your costs with the open-source Pillar Business Wallet. Join our conversation Thursday, 30th of November. Governments continue to try to regulate cyberspace, often with little effective impact. Security professionals struggle to design and operate infrastructure that will comply with rules written with Semantically Intentional Ambiguous Meaning (SIAM). Learn from the classrooms of one of the world's great universities the new methods for navigating those challenges and putting in place rules that are effective for managing infrastructure. Cybersecurity is at a crossroads and requires a dramatic shift to adequately support the needs of business owners and security administrators as digital transformation challenges their needs and investments. Managing multiple cloud providers and dramatic increases in the number of endpoints generating data and the subsequent volume of data means enterprise security teams no longer have the requisite skills and bandwidth to deal with complicated security products. Building in security from the beginning quickly and cost-effectively is an industry game changer, especially with new growth markets like Big Data, Blockchain, Cloud Computing, Internet of Things and Digital Payments. Multi-cloud environments and government regulations and industry compliance add to the complexity of maintaining a manageable and effective data protection strategy. Transforming encryption and key management (data protection in general) into a click and deploy model reduces internal business barriers between security teams, DevOps and product teams and alleviates disparate security policies, so you know where your data is and that it is secure. The way people consume security is changing by taking an on-demand approach similar to the Netflix philosophy. In this webinar, we will discuss how cloud-based security is simplifying workflow processes, changing cost/benefit models to drive us towards a pervasiveness of encryption and key management that will de-risk data and connectivity in similar ways to anti-virus and firewalls. This discussion focuses on delivering a secure API layer and how Open Banking will deliver a secure Open Future..
Financial institutions are increasingly facing attacks on multiple fronts. Cyber criminals continue to target online banking using malware to hijack customer transactions and banking sessions. While there has been an overall drop in infections related to these consumer threats, financial institutions are now facing new types of attacks in the form of large-scale financial heists. Attack groups such as Fin7 and Lazarus are deliberately targeting financial institutions in audacious attacks that are reaping large rewards. They are using living off the land and fileless attack tactics similar to APT groups. But also extortion with DDoS attacks or business email compromise (BEC) scams are increasingly bothering financial corporations. In this webcast on the current financial threat landscape, Symantec takes a look at the most prevalent and significant financial threats. With over 280,000 members, the Information Security Community is the largest community of cybersecurity professionals in the industry. Let's build a network that connects people, opportunities, and ideas. If you are involved in purchasing, selling, designing, marketing ... or using information security solutions - this group is for you. Covered topics include compliance, encryption, anti-virus, malware, cloud security, data protection, hacking, network security, virtualization, and more.